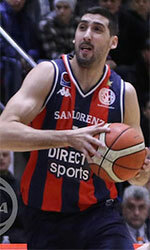 Tenth-ranked Bigua (8-11) gave a tough game to first ranked Nacional (14-5) in Montevideo on Monday. The visitors managed to secure only one-point victory 92-91. However their fans expected much easier game. It ended at the same time the two-game winning streak of Bigua. It was a great evening for American John DeGroat (201-85, college: Pittsburgh) who led his team to a victory scoring 26 points and 7 rebounds. His fellow American import forward Anthony Danridge (196-86, college: N.Mexico) helped adding 26 points, 5 assists and 4 steals. At the losing side American forward Jeremis Smith (203-86, college: Georgia Tech, agency: Pro Sports) responded with 24 points and 8 rebounds (on 11-of-14 shooting from the field). Bigua's coach rotated ten players in this game, but that didn't help. Nacional maintains first place with 14-5 record. Bigua at the other side keeps the tenth position with 11 games lost. Nacional's supporters look forward to an exciting derby game next round, where their team will face at home their local rival from Montevideo Aguada. Important game to mention about took place in Montevideo. Second ranked Malvin (13-4) saved a 1-point derby victory on the road edging 6th ranked Hebraica (11-7) 30-29 on Monday evening. It ended at the same time the six-game winning streak of Hebraica. It was an exceptional evening for American forward Shawn Glover (201-90, college: ORU, agency: Haylett Sports) who led the winners and scored 21 points, 9 rebounds and 5 assists (on 8-of-9 shooting from the field). Hatila Passos accounted for 17 points and 6 rebounds. Malvin's coach Pablo Lopez allowed to play the deep bench players in such tough game. Forward Federico Haller (198-88) came up with 32 points and 9 rebounds for Hebraica in the defeat. Malvin have an impressive series of six victories in a row. Defending champion maintains second place with 13-4 record behind leader Nacional. Hebraica at the other side keeps the sixth position with seven games lost. They share it with Aguada and Goes. Malvin's supporters look forward to an exciting derby game next round, where their team will face at home their local rival from Montevideo Bigua. Another exciting game was a derby match between two local teams from Montevideo: Urunday Univ. (#3) and Olimpia (#4). Urunday Univ. (13-5) crushed visiting Olimpia (12-7) by 16 points 94-78. Emilio Taboada fired 24 points and 9 assists for the winners. John Dickson produced 24 points for lost side. The victory was the sixth consecutive win for Urunday Univ.. They maintain third place with 13-5 record behind leader Nacional. Loser Olimpia dropped to the fifth position with seven games lost. Urunday Univ. 's supporters look forward to another derby game next round, where their team will travel locally in Montevideo to the arena Verdirrojo. Bottom-ranked Sayago (0-19) is still winless. This time they lost on the road their 19th consecutive match to eighth ranked Aguada (11-7) 100-83. Worth to mention a great performance of Demian Alvarez who helped to win the game recording 24 points. Aguada moved-up to sixth place, which they share with Goes and Hebraica. Sayago lost their sixteenth game in a row. Newly promoted team still closes the standings. Aguada's supporters look forward to an exciting derby game next round, where their team will travel locally in Montevideo to the arena Nacional. Another exciting game was again a derby between two local teams from Montevideo: Defensor (#5) and Verdirrojo (#13). Defensor (12-5) won against visiting Verdirrojo (2-16) 96-82. It was a great evening for Alfrie Kelley who led his team to a victory scoring 22 points and 6 assists. Defensor moved-up to fourth place. Verdirrojo lost their sixth game in a row. Newly promoted team keeps the thirteenth position with 16 games lost. Defensor will face bottom-ranked Sayago (#14) on the road in the next round and are hoping to win another game. Verdirrojo's supporters look forward to an exciting derby game next round, where their team will face at home their local rival from Montevideo Urunday Univ.. In the last game of round 19 Atenas lost to Welcome on the opponent's court 91-100. The most impressive stats of the last round was 32 points and 8 rebounds by Nick Waddell of Welcome. Bottom-ranked Sayago (0-19) is still winless. This time they lost on the road their 19th consecutive match to eighth ranked Aguada (11-7) 100-83. Aguada forced 20 Sayago turnovers. Worth to mention a great performance of forward Demian Alvarez (192-84, agency: Pro Sports) who helped to win the game recording 24 points. Naturalized Italian guard Federico Bavosi (185-81, agency: Pro Sports) contributed with 14 points, 6 rebounds and 5 assists for the winners. American forward Duke Crews (203-88, college: Bowie St.) answered with 33 points (!!!) and 9 rebounds and the other American import forward Calvin Warner (201-80, college: Jacksonville) added 18 points, 13 rebounds and 8 assists (made all of his twelve free throws !!!) in the effort for Sayago. Five Aguada and four Sayago players scored in double figures. Aguada moved-up to sixth place, which they share with Goes and Hebraica. Sayago lost their sixteenth game in a row. Newly promoted team still closes the standings. Aguada's supporters look forward to an exciting derby game next round, where their team will travel locally in Montevideo to the arena Nacional. Tenth-ranked Bigua (8-11) gave a tough game to first ranked Nacional (14-5) in Montevideo on Monday. The visitors managed to secure only one-point victory 92-91. However their fans expected much easier game. It ended at the same time the two-game winning streak of Bigua. It was a great evening for American John DeGroat (201-85, college: Pittsburgh) who led his team to a victory scoring 26 points and 7 rebounds. His fellow American import forward Anthony Danridge (196-86, college: N.Mexico) helped adding 26 points, 5 assists and 4 steals. At the losing side American forward Jeremis Smith (203-86, college: Georgia Tech, agency: Pro Sports) responded with 24 points and 8 rebounds (on 11-of-14 shooting from the field) and forward Gonzalo Meira (192-88, agency: Pro Sports) scored 17 points (made all of his eight free throws). Both teams had four players each who scored in double figures. Bigua's coach rotated ten players in this game, but that didn't help. Nacional maintains first place with 14-5 record. Bigua at the other side keeps the tenth position with 11 games lost. Nacional's supporters look forward to an exciting derby game next round, where their team will face at home their local rival from Montevideo Aguada. Important game to mention about took place in Montevideo. Second ranked Malvin (13-4) saved a 1-point derby victory on the road edging 6th ranked Hebraica (11-7) 30-29 on Monday evening. It ended at the same time the six-game winning streak of Hebraica. Malvin shot 63.0 percent from the field and made 24-of-28 charity shots (85.7 percent) during the game. Their players were unselfish on offense dishing 21 assists. It was an exceptional evening for American forward Shawn Glover (201-90, college: ORU, agency: Haylett Sports) who led the winners and scored 21 points, 9 rebounds and 5 assists (on 8-of-9 shooting from the field). Naturalized Brazilian center Hatila Passos (211-85, college: N.Mexico St.) accounted for 17 points and 6 rebounds for the winning side. Five Malvin players scored in double figures. Malvin's coach Pablo Lopez allowed to play the deep bench players in such tough game. Forward Federico Haller (198-88) came up with 32 points and 9 rebounds and naturalized Spanish guard Gustavo Barrera (194-85) added 21 points and 4 assists respectively for Hebraica in the defeat. Malvin have an impressive series of six victories in a row. Defending champion maintains second place with 13-4 record behind leader Nacional. Hebraica at the other side keeps the sixth position with seven games lost. They share it with Aguada and Goes. Malvin's supporters look forward to an exciting derby game next round, where their team will face at home their local rival from Montevideo Bigua. Another exciting game was again a derby between two local teams from Montevideo: Defensor (#5) and Verdirrojo (#13). Defensor (12-5) won against visiting Verdirrojo (2-16) 96-82. Defensor made 19-of-25 free shots (76.0 percent) during the game. Defensor outrebounded Verdirrojo 49-30 including a 38-22 advantage in defensive rebounds. Verdirrojo was plagued by 27 personal fouls down the stretch. It was a great evening for American point guard Alfrie Kelley (183-85, college: S.Carolina) who led his team to a victory scoring 22 points and 6 assists. His fellow American import forward Patrick Sanders (201-85, college: Cal-Irvine) helped adding 21 points and 7 rebounds. At the losing side guard J Mayora (180-95) responded with 26 points and 6 assists and Federico Cholaquides (183-93) scored 12 points, 6 rebounds and 4 assists. Five Defensor and four Verdirrojo players scored in double figures. Defensor moved-up to fourth place. Verdirrojo lost their sixth game in a row. Newly promoted team keeps the thirteenth position with 16 games lost. Defensor will face bottom-ranked Sayago (#14) on the road in the next round and are hoping to win another game. Verdirrojo's supporters look forward to an exciting derby game next round, where their team will face at home their local rival from Montevideo Urunday Univ..
Another exciting game was a derby match between two local teams from Montevideo: Urunday Univ. (#3) and Olimpia (#4). Urunday Univ. (13-5) crushed visiting Olimpia (12-7) by 16 points 94-78. Urunday Univ. made 18-of-21 free shots (85.7 percent) during the game. It was a great shooting night for Urunday Univ. especially from behind the arc, where they had solid 52.6 percentage. They looked well-organized offensively handing out 21 assists. Emilio Taboada (191-82, agency: Pro Sports) fired 24 points and 9 assists for the winners. American Quinnel Brown (198-83, college: Auburn) chipped in 25 points and 8 rebounds. Five Urunday Univ. players scored in double figures. American forward John Dickson (198-90, college: Sacramento St.) produced 24 points and the other American import Brandon Nazione (202-94, college: E.Michigan) added 14 points and 5 rebounds respectively for lost side. The victory was the sixth consecutive win for Urunday Univ.. They maintain third place with 13-5 record behind leader Nacional. Loser Olimpia dropped to the fifth position with seven games lost. Urunday Univ. 's supporters look forward to another derby game next round, where their team will travel locally in Montevideo to the arena Verdirrojo. We cannot really consider it an upset in the game between close teams in Montevideo where 11th ranked Atenas (6-13) were defeated by twelfth ranked Atletico Welcome (6-13) 100-91 on Tuesday. Atletico Welcome looked well-organized offensively handing out 27 assists. It was a great evening for American center Nick Waddell (200-89, college: Grand Valley St.) who led his team to a victory scoring 32 points and 8 rebounds (on 12-of-14 shooting from the field). Guard Matias De-Gouveia (180-88) helped adding 27 points and 9 assists. Four Atletico Welcome players scored in double figures. At the losing side American-Jamaican power forward Phil Henry (203-91, college: E.New Mexico) responded with 34 points (!!!) and forward Mateo Pose (190-94) scored 20 points, 5 rebounds and 4 assists (on 7-of-9 shooting from the field). Atletico Welcome moved-up to eleventh place, which they share with defeated Atenas. Atenas lost their fifth game in a row. Atletico Welcome's supporters look forward to an exciting derby game next round, where their team will face at home their local rival from Montevideo Trouville.